A campaign, backed by donations from members of the Fix the Princes Hwy at Heathcote Facebook group, has gone live this morning, with a large display sign installed at Heathcote to let some of the 25,000 people who use the Princes Hwy a day what the so-called Minister for the Illawarra, Paul McLeay, as well as Roads Minister Borger have done by stopping the RTA’s plan to implement a clearway at Heathcote. Update: The Minister has used his political influence to try and shut down our protest, with senior staff at the RTA telling the Traffic Signs manager at Kennards to remove the sign “or else”. Funny, I’m told the IGA – one of the noisy minority – was allowed to put a sign there advertising their business, but we’re not allowed to inform the public. Looks like the Minister doesn’t believe in people’s right to protest and wants to stop the people of the Illawarra from realising how he has actively intervened in the planned clearway at the expense of tens of thousands of his constituents. Update 2: After being requested by the RTA to move the sign, the guys from Kennards went along to comply, but it turns out they were too late. No word yet on whether it was the RTA or one of the noisy locals who nicked the sign, but you can be certain that there’s some serious people who don’t want us to know the truth about how we’ve been betrayed and screwed over. Update 3: The Minister says he didn’t ask for it to be moved, but that isn’t to say one of his flacks didn’t on his behalf. By trying to disable the sign with hammers and towing it without unchaining it, the RTA have done a few hundred dollars worth of damage – morons. Anyway, after a few day’s worth of repairs, and getting permission to put the sign on land that the RTA doesn’t own, we’ve got it back out on the road for the next two days. All in all, a good dress rehearsal for next March. Give us back our highway! Unfortunately, this probably won’t be our last action on this issue because very few of us have any confidence that McLeay has any courage at all to do the right thing and reverse his crazy decision. If the situation at Heathcote drives you mad too, join our Facebook Group. My Pop passed away earlier this week. While very sad for all of us, it wasn’t tragic, as he’d been going down hill a fair bit over the last couple of months – his heart had finally had enough, and just quietly, I think he had too. Mum – his oldest daughter – asked me to give the Eulogy, and since Pop never had anything to do with the internet or online, I though it would be fitting to leave a little footprint of his life here on my blog. Rest in Peace old boy – we’ll all miss you. Pop used to love a bit of a flutter. He had a greyhound when he was younger, and he and his mates would drive from Tamworth with a few mates down to the track at Newcastle to watch the dog go around and put a few bob on. Later, he enjoyed taking his daughters to Harold Park Paceway to see the trots. So reflecting on his life, I don’t think he’d mind me saying that to have made it to the ripe old age of 89 was beating some pretty tremendous odds. But more about that later. 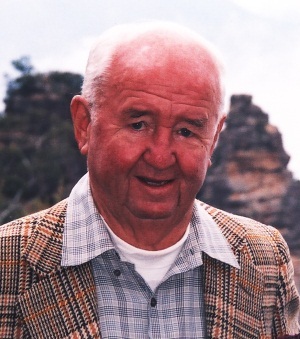 Pop was born on the 10th of February, 1921, the youngest of 6 into a family that lived on the land – a dairy farm at Loreton, not far from Taree. Upon leaving school, Pop only had a couple of choices, and since he wasn’t keen on working at the Bank, he trained to be a teacher, studying at the Teacher’s College in sunny Armidale, right on the eve of WW2. When war broke out, Pop tried to enlist. Fortunately for him – and the rest of us – the army wouldn’t have him because of his flat feet. The air force wouldn’t have him because he was colour blind. And the Navy was out of the question… because it was the Navy. Pop’s contribution to the war effort then was to apply his training as a science teacher at Farrah, near Tamworth. There he taught the many young men from 460 Sqn destined for the battles of Europe and the bomber command as much physics as he could in the time he had. It was during his time in Tamworth that he was introduced by a mutual friend to his future wife, Molly, who was working with the local newspaper. They fell in love and married on the 5th of May 1951 – they were due to celebrate their 60th wedding anniversary early next year. Now married, Pop had to leave his bachelorhood as a Hall Master at Farrah behind, and he and Nan moved to Tumut. They had Anne and then Trish shortly afterwards, however it seemed both girls wanted to be a bit closer to the City. Anne gave everyone quite a health scare when she ate a bunch of delicious looking ant poison, and Trish was quite sick with some mystery allergies. Putting his family first – a hallmark of Pop’s life – they moved to Sydney in 1957 to be closer to quality medical care for the girls. Pop spent a lot of time working to provide for the family. He worked at many schools through those years as a science teacher, and even taught at TAFE at night to make ends meet. Unfortunately, in 1975, his lifestyle caught up with him, and he suffered his first heart attack. At this point, the odds on a long life lengthened significantly, but with a stroke of luck, he was admitted into what was then an experimental procedure, and became one of Australia’s first heart-bypass recipients. With his health scare, he decided to retire, and so he and Nan moved down to Kiama on the south coast in 1977 – part of the original sea-change brigade and ahead of their time. After getting into the lawn bowls in a big way – it was kinder on the heart than squash, and besides, you could have a beer while you played – Pop and Nan decided to open a school holiday camp for their increasing brood of grandchildren. I used to think of it as “holidays at Nan and Pop’s” when I was a kid – I now know mum and dad thought of it as respite. In any case, it was great when I’d go and visit to enjoy time with Nan and Pop. My memories of those years with Pop have three main themes – sport, newspapers and cards. My father wasn’t much of a sports junkie, so I’d never really had someone watch a game with me and explain the tactics and crazy rules. Pop was surprisingly patient, and I remember sitting there for hours watching cricket and being taught to love the slowest game in the world. When it comes to newspapers, I think Pop kept Fairfax in business for quite a few years there. Out the back in the sitting room was always a pile of newspapers – and I really enjoyed (once I could read) sitting there and pouring through News Review, Column 8, and realising that Spectrum was complete rubbish. Then there were cards. Pop taught me Gin Rummy and many others, but I’m sure he was most proud when he taught me Patience – like Solitaire, but with cards. It kept me quiet for hours – he must have been stoked. In the Christmas of 2001/2, Pop’s health took a turn for the worst. No one had expected the bypass to keep him going as long as it had – 25 years by this point – so when he had a bunch of other heart problems, we feared the worst. He’s already beaten pretty serious odds, but then he beat them again. Pop spent a lot of time over that Christmas at Wollongong hospital, and I lived just down the road, so I in turn made sure I visited pretty regularly. We formed a pretty good bond and relationship through the period of fear, uncertainty and hallucinations, and being from the silent generation, I think he appreciated the fact I was now a man and he could talk to me, man to man. I remember one occasion a day or so after he’d been put under, as he sat there recovering in the ICU. He was completely convinced that there were black webs on the roof above the bed, and that people were out to get him. We talked, I made him demonstrate how strong he was by shaking my hand vigorously, and then I told him firmly to be nice to the nurses and that no-one was going to get him because they’d have to get through me first. That seemed to calm him a bit, but when I raised it a bit later, it was clear he had absolutely no recollection of the whole experience. But he always remembered that hand shake. After coming back from the brink – again – in the early 2000’s, it was then time to look at better accommodation for he and Nan than their house in Kiama. His strong-willed daughters had decided that the best spot was a retirement village, but the old boy wouldn’t have a bar of it. I remember taking him for a walk, and after convincing him it was actually his idea, and that he wasn’t going to be bossed around in his dotage by girls, he went along with the plan. Pop’s health had a few more close calls over the intervening years – he even managed to get a 2nd bypass operation, and this one was performed by the junior understudy from the first one! But in the last few weeks, he’d really started to go downhill. You beat the longest odds anyone will get, you provided for your family in a way that makes us all so proud and grateful, and now it is your turn to rest in peace. It was your time mate, we’ll miss you but most of all we’ll never forget you and all you’ve done for us. As you’re probably aware, the Minister for the Illawarra decided to screw over the people of the Illawarra earlier this week when he over-ruled advice from the RTA to put in a clearway at Heathcote. NSW Labor used the cover of the Federal election campaign to make their cowardly announcement, and they’re hoping the thousands of us who suffer a day will just silently put up with it and that the issue will drop off the radar. We don’t want to let that happen. 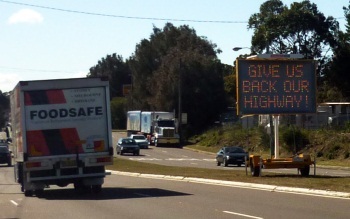 To keep the issue up there, we’d like to hire one of those yellow electronic signs, and put it on the median strip for north-bound traffic to read, reminding people that Labor has screwed Illawarra motorists over. We’ll ask people to call McLeay and tell him what they think while they’re waiting in traffic. We’ll also try and get some newspaper coverage of the campaign, and the plan is to make this Facebook group the focus. Unfortunately, hiring these signs costs money. About $650/week. To make it happen we need your support. If you care about this issue, please reply and let us know if you’re able to pledge $20 or $30 bucks to the cause. While it is unlikely we’ll get a backflip (on a backflip on a backflip) from McLeay on this, we need Barry O’Farell to make an announcement that they support turning this side-street back into a Highway (70kph, clearway) before they get elected. Actions like this sign board and lobbying are all necessary to make this an issue – so, to make a change, we need your support. Given the NSW’s Government’s betrayal of Illawarra residents and their decision to make the Highway through Heathcote more like a back street, it only seems fair that us poor suffering motorists should treat the back streets of Heathcote like a highway. Here’s a map of just how to do that. The map below details how by turning off at the start of the industrial park, you can drive along 50Kph back streets and avoid some of the traffic snarls that are commonplace during peak hour. While these streets are still slow and narrow, at least you’ll be sharing some of your suffering with the noisy locals who’ve forced this upon us all. 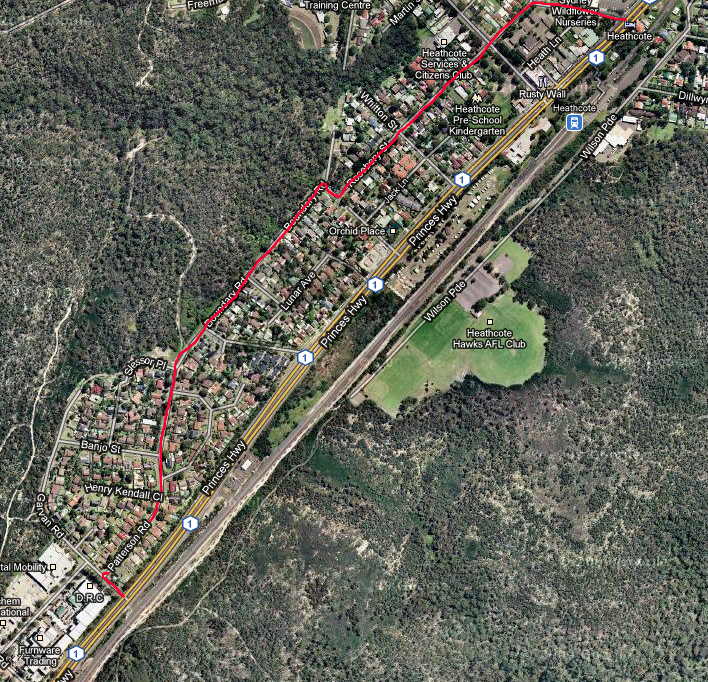 A week or so ago I wrote a letter to Paul McLeay, Minister for the Illawarra and Member for Heathcote, expressing concern that the proposal to implement a clearway at Heathcote was being derailed by a very noisy and small minority of people who would rather the 4th biggest road into Australia’s biggest city treated like a suburban side street. With an unjustified knee-jerk reaction slowing the speed of this major road to 50kph, the RTA had advised the only way to try and alleviate the critical traffic snarls at Heathcote during peak periods was to implement a Clearway. Given how common sense this is for a road along one of Australia’s busiest commuter corridors, with around 40,000 vehicles a day using it, the only surprise should be that it wasn’t done sooner. Unfortunately, after an outcry from a very noisy minority, the Minister for the Illawarra, Paul McLeay, along with the Minister for Roads, David Borger, have demonstrated a complete lack of leadership and have decided against the advice of the RTA not to implement a clearway at Heathcote. Their spineless and hollow excuse is attached in a media release. Remember, this is a major highway. People who want to use these shops can park on side streets or around the back. These are shops that wouldn’t exist it if wasn’t for the highway. And yet in response to some media pressure from Alan Jones, the Minister for the Illawarra has chosen to completely screw the tens of thousands of his constituents who use the road each day – costing each of them 80 hours a year of lost time with their families while they sit in their cars wasting fuel and polluting the environment – to show favouritism to a dozen or so unreasonable whingers. If you want to make your voice heard and call this “Minister” out for his disgraceful and spineless action, send him an email telling him just what you think of his lack of leadership and betrayal of the people he is supposed to represent. Of course, with an election only 9 months off, you’ll get to tell the Minister what you think of his performance at the ballot box. It will be important, however, to make sure the alternative government know how you feel; the noisy minority at Heathcote have already been in their ear and we don’t want them to misunderstand the importance of this issue to the people of the Illawarra. To make sure they realise that the current Government has it completely wrong, send an email telling the Shadow Minister for Road, Andrew Stoner and Shadow Minister for the Illawarra, Greg Pierce what you think of the current government’s arrangements at Heathcote.